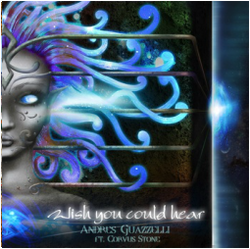 “Wish You Could Hear”, the nearly 12 and half minute epic instrumental piece from Andres Guazzelli is unlike anything my ears have ever had the pleasure of feasting upon. The music is so well written and crafted that it takes multiple listens to even get a real taste of the musical feast before you. Joined by the boys in Corvus Stone, this track is a majestic rocker that builds upon so many moods and feelings that it’s almost some kind of insane roller coaster ride through a landscape of myriad rock genres. The melding of the hard rock elements with those of the more symphonic sounds is carried out so beautifully and played so well, transitioning seamlessly from one section of this beast to the next. With searing guitar solos, screaming strings, pounding drums, and more organ than you could shake a stick at, “Wish You Could Hear” is a musical odyssey for the ages. In this day and age, obviously a 12 and half minute progressive rock instrumental is not seeing a lot of time in the mainstream. But with songs like this, who in their right minds needs a mainstream?